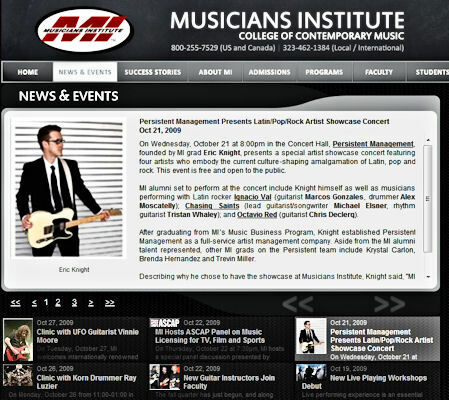 On Wednesday, October 21 at 8:00pm in the Concert Hall, Persistent Management, founded by MI grad Eric Knight, presents a special artist showcase concert featuring four artists who embody the current culture-shaping amalgamation of Latin, pop and rock. This event is free and open to the public. 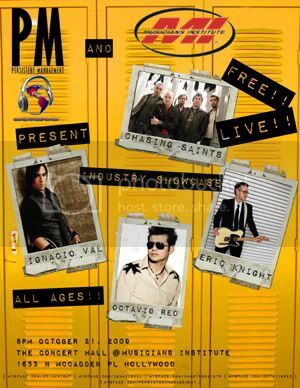 MI alumni set to perform at the concert include Knight himself as well as musicians performing with Latin rocker Ignacio Val (guitarist Marcos Gonzales, drummer Alex Moscatelly);Chasing Saints (lead guitarist/songwriter Michael Elsner, rhythm guitarist Tristan Whaley); and Octavio Red (guitarist Chris Declerq). After graduating from MI’s Music Business Program, Knight established Persistent Management as a full-service artist management company. Aside from the MI alumni talent represented, other MI grads on the Persistent team include Krystal Carlon, Brenda Hernandez and Trevin Miller. Describing why he chose to have the showcase at Musicians Institute, Knight said, "MI gave me the tools I needed to start this company and so it’s great to able to come back here and play a show like this that will hopefully inspire current students to do the same." 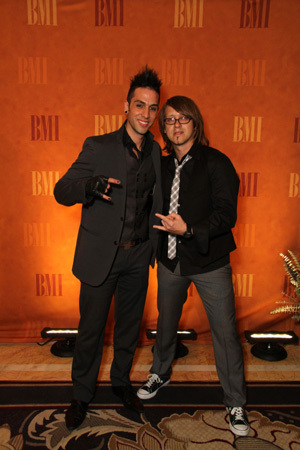 Eric Knight and Ignacio Val recently attended the BMI Awards in Las Vegas at the Bellagio. Here are Ignacio and Eric on the red carpet. LOS ANGELES, October 15, 2009 – Artist management company Persistent Management will present four artists who embody the current culture-shaping amalgamation of Latin, pop and rock: Igancio Val, Eric Knight, Octavio Red and Chasing States will perform live on Wednesday, October 21 at Musicians Institute (1655 N McCadden Pl, 90028) in Los Angeles. The show is free, and members of the public of all ages are encouraged to attend. Eric Knight has taken the contemporarily appropriate “do-it-yourself” attitude to a whole new level. Opening for acts including KISS, Dave Matthews Band, Aerosmith and Kid Rock, Knight has worked tirelessly to introduce his original music to the masses. In December 2008, he walked away with Outstanding Male Solo Artist bragging rights at the Rockies Awards in Hollywood. Dressed to kill in a sharp suit and tie, he offers a decidedly unbridled take on rock that remains tastefully aware of rock and roll’s pioneers but determined to redefine it even as he picks up the torch. Knight is currently working on his third album, Delusions of Grandeur, slated for release later this year. Featuring melodies that share themes of love, loss, loneliness, regret and redemption, Chasing Saints’ self titled first album resonates with songs about not only living life, but recovering from it. Their unique blend of sentimental lyrics and rock-inspired guitar riffs has drawn praise from music supervisors and fans alike. The inspirational and harmonically rich "Somedays" has already garnered praise in the form of an L.A. Music Award nomination for best adult contemporary group with vocal. Intense and yearning, "You Again" found its way onto the small screen as a featured song on CBS’s Cold Case, while "Ignorance" was featured in the independent film Return with Honor. Talented and experienced, Chasing Saints is determined to set new industry standards. resonated with producers and even more with radio listeners and established him as a favorite performer of the Classic Super Estrella in 2007. Bolivian export Ignacio Val made his initial mark upon the public’s consciousness when he joined legendary Franco De Vita on tour throughout South America to duet on one of Franco's greatest hits, “Si La Ves.” Since then, Val has played throughout Southern California in key venues including The Whisky a Go Go, The Temple Bar, The Gig, The Rumba Room, B.B King’s, The Joint and The Good Hurt, among others. 2009 has already been an incredible year for the rising star, who has made multiple TV appearances on Univision’s Primera Edicion and Tu Estilo. Ignacio’s supercharged shows, songs and charisma combine to cultivate a Latin superstar-in-the-making. Persistent Management is a full service artist management company. Launched in the spring of 2008 our artist roster includes: Eric Knight, Chasing Saints & Ignacio Val. We have also recently branched out into the recording and multimedia landscape with the recent signings of photographer extraordinaire Ken Weil, songwriter/producer Michael Elsner, director Bryan Dos Reis, fine artist Michelle Gomez and now working with Jeff Abercrombie bassist from the multi-platinum rock act Fuel in his new venture Thud Studios. With headquarters based in Los Angeles, PM is already working with some of today's hottest artists on the music as well as creative scenes and is poised and ready to become one of the premiere management companies in the entertainment industry. PERSISTENT MANAGEMENT | MUSICIANS INSITITUTE PRESENT MUSIC INDUSTRY SHOWCASE | FREE ALL AGES SHOW WEDNESDAY OCTOBER 21, 2009!!! AT MUSICIANS INSTITUTE IN HOLLYWOOD!! !